If you’ve spent any time taking care of children, aging parents or those with special needs, you know it’s is hard work. Staying on top of and organizing files, contacts and medications, while coordinating with caregivers and trying to keep all that information secure and private is challenging to say the least. This is where CareZone comes into play. Since launching in February of this year, the Seattle-based startup has been building out a private, secure online service that allows people and families to better take care of their loved ones. Thanks to early traction in a few of its key markets and the fact that CareZone is being led by co-founder Jonathan Schwartz who also happens to be the former President and CEO of Sun Microsystems, the startup was quick to secure a hefty $13 million series A investment from NEA and Catamount. Since then, CareZone has been quietly building out a cloud service that makes it easy for families and parents to organize and manage key care information on the web — and now on their mobile devices. While its leaders eschew advertising and data mining, the startup is today launching a couple of key features that Schwartz hopes will not only introduce it to larger groups of people but can boost its appeal for professional caregivers, health companies, outpatient hospitals and more — those who could potentially become regular, paying customers. To that point, CareZone is currently free to use for all, however, at the start of next year, the startup will be putting up a paywall for groups, charging somewhere between $5 and $25/month depending on the size of the group. The $25/month charge will likely be for groups of 100+. Going forward, the co-founder wants to continue beefing up the service’s paid feature set, like additional data storage, for example. To further extend its core offerings, CareZone is today rolling out three new features, including an integrated voice broadcast feature which aims to eliminate time-consuming phone trees for big groups of people. On top of that, the service is also adding a shared family calendar to help users coordinate care as well as mobile accessibility through its new iPhone app. To break that down, CareZone’s new broadcast product basically lets users quickly distribute a voice message to others in their care network, allowing them to select up to 100 people from their CareZone or iPhone contact lists, and record and update messages — after which CareZone shows them a status page which makes it clear who has received the message and who hasn’t. In turn, the startup’s new calendar makes it easy for caregivers to create a schedule for their parent, child or loved one, share it with their network and track assignments and completion of tasks. 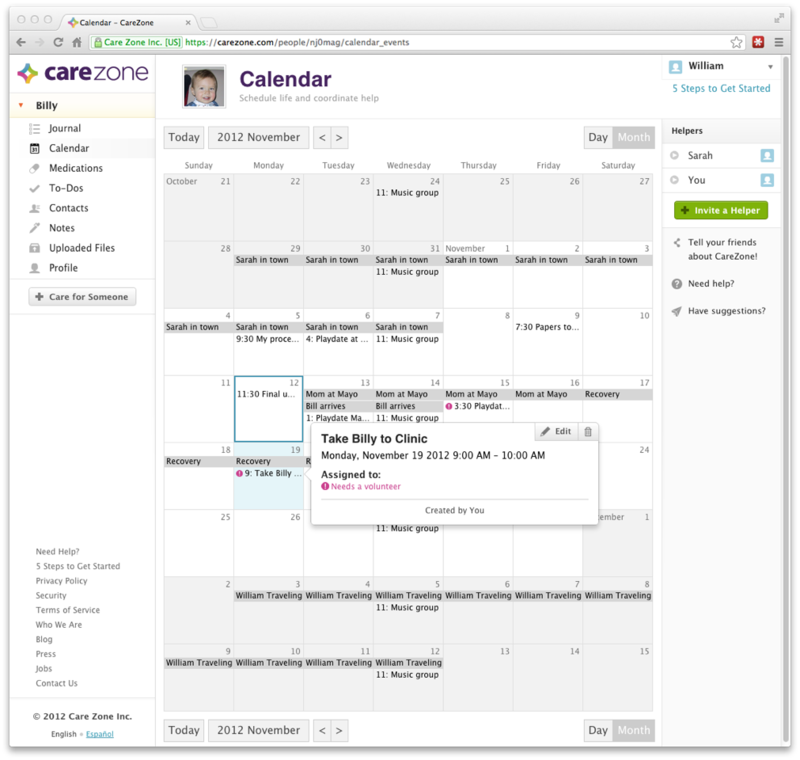 Whether you want to remember to take your dad to physical therapy or to call in little Jimmy’s new prescription, CareZone’s Calendar takes a page from popular consumer-facing task managers and social calendars, removing a significant amount of pain from the process of managing the details of schedules, appointments and so on. The startup’s new iPhone app brings combines these new group sharing and organizational features with its core product, enabling users to stay on top of their to-do lists while on the go. 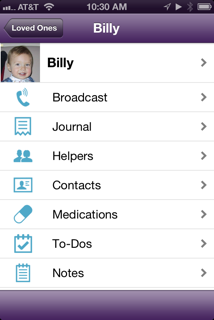 Because users can share their CareZone accounts, the new iPhone app makes it easy for users to share contact or medication info through a share-able journal and get access to scanned or stored images and docs from the road. To date, CareZone has been predominantly focused on the nuclear family, but with its new additions, CareZone is beginning to put the pieces in place that will allow it to appeal to a wider audience. Going forward, Schwartz says, the team will be more aggressively reaching out to the healthcare community and considering potential integration opportunities. In this respect, the CEO cites Uber as an example. If they know that a user needs to get dad to his 2pm physical therapy appointment and is in need of transportation, why couldn’t they just initiate that call to Uber? Through these types of third-party integrations, Schwartz sees an opportunity for CareZone not only to be a management tool — but eventually a healthcare marketplace. By integrating with social services and by building a more robust mobile platform, the startup can begin to help hospitals, say, connect their patient records with CareZone family records or get access to secure medical reporting and patient communication. The more value they can add on the marketplace side, the more the platform becomes appealing to hospitals and care facilities, in turn becoming a viable source of revenue for the startup. More on CareZone at home here.